Whether it’s a conference or a department meeting, professional development is integral to teaching. Prompt: Write a post about ways to make professional development more effective. How do you think administrators can change the stigma attached to professional development? How do you think professional development can evolve in a digital environment? I’m a bit late to the game, but here’s my post on PD. I’d take a bit of a break from blogging for August and I forgot how writing keeps me motivated 🙂 Motivation level is back up and back to work it is! I seem to, more & more, post my articles a day or two late (but hopefully not a dollar short in quality)! Here is my latest on PD and how I’d like to see it used more effectively by school librarians. Another wonderful post from Alicia. When I learned about making slide presentations more visually stimulating, I redid all my lessons…it took me through the school year, but it really paid off the next year with increased student interest! And I, too, rely on Pixabay! Nina always gives me something to think about more deeply. Thanks! 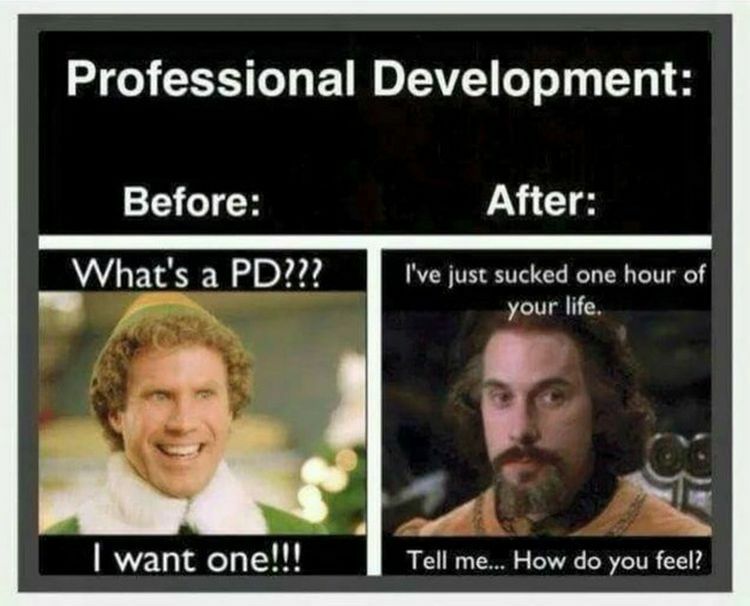 I’ve previously written about professional development vs professional learning -it’s different!